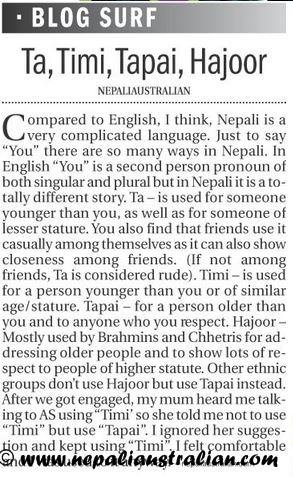 I am so glad to report that another of my post is published in The Himalayan Times , one of the leading daily papers in Nepal. It is such an honored to be regularly published in one of the popular paper . It was published in 26 August 2014 under Blog Surf section. 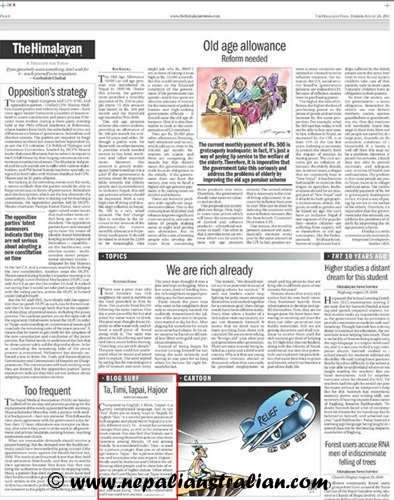 If you are in Kathmandu, get the paper and find me on page 8 and for those who can’t, here is how it looked :). Please read the full post here and share your view Ta‚ Timi‚ Tapai‚ Hajoor. This entry was posted in Published and tagged australian nepali, Blog Surf, M from nepaliaustralian, Nepal, Nepali, Nepaliaustralian, nepaliaustralian blog, The Himalayan Times. Bookmark the permalink. It is for sure compare to English. It’s really an Asian thing, isn’t it ? I blogged about that too. In the Philippines, “YOU” has different forms and uses too. I think so because in English we don’t have this trouble as everyone is You ..